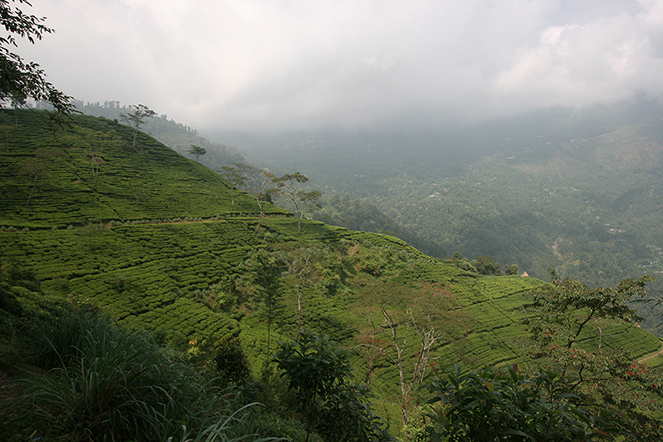 Around the world, much more Darjeeling tea is sold than is actually produced in Darjeeling. There are also considerable differences between gardens in terms of quality, and considerable differences in quality within the same garden. These differences are due to major variations in weather (a garden might produce excellent teas in April, for example, which is impossible in July during the monsoon) and because the same plantation will have tea plants growing at widely varying altitudes. In Tukvar, for example, 1,000 metres in altitude separates the top of the highest plot and the lowest point on the plantation. So we must be careful when we buy Darjeeling teas, and we should never rely on the name alone, however prestigious it may be. We should also bear in mind that plantations situated on the plains, of mediocre quality, sit alongside those within the appellation, and human nature being what it is, there is a great temptation to sell Terai teas under the Darjeeling name. Connoisseurs of first-flush Darjeelings must wait a few more weeks to try the new spring harvest. In this region of the world, tea plants are dormant between November and February, as the soil is too cold for Camellia sinensis. It’s very interesting what you say. I know the tea plantations on the plains north of Siliguri as well as ones on the edge of Darjeeling itself. As you know Darjeeling is another 2000 metres up from there with Kurseong halfway up with it’s own teas. It would be very easy to sell tea from the flat lands just a bus ride away as Darjeeling.